The kind of soil you are building on is going to have a huge impact on your project, and in particular on your foundations. Your foundation is in direct contact with the soil underneath it, so if the soil is unstable, the foundation is going to be as well. But the world can’t be limited to growth in areas where the soil conditions are perfect; in fact, these perfect soil conditions are few and far between. So instead, construction projects both big and small that are being built on unfavorable soil conditions will require the help of geotechnical design to find solutions that create a firm foundation. The makeup of the soil at the job site is going to affect many factors about the foundation, including its depth and what kind of foundation is used. A geotechnical engineer can evaluate the soil at the job site and provide feedback as to what solutions are going to be best suited for the soil’s condition. Which kind of soil is best? Soils are made up of combinations of clay, silt, and sand. Different combinations are going to create different building conditions. Additionally, the shape of the grains within the soil–which is essentially broken down pieces of rock and organic matter–can have different shapes in different regions. The difference in the shape of the particle can affect how stable the soil is and how well it’s going to be suited for construction. There is no “perfect” soil for construction. Each soil type, combination, and particle shape are going to require different kinds of foundations and geotechnically engineered solutions for maximum stability. However, the best soils are the ones that can be compressed and consolidated. These are more likely to help hold the structure in place and resist shifting or settling. You may hear a geotechnical designer talk about a soil’s cohesiveness; this is how much it can be compacted and how well it holds together when it is. But other factors can have an effect on even the best soils, including how much water flows through the area, the drainage that’s in place for that water, and what natural weather phenomenon the soil could be exposed to (including earthquakes, tornadoes, and hurricanes). A geotechnical designer will account for all of those possibilities and ensure that even good-quality cohesive soils have solutions in place for external factors that could impact it negatively. What is the worst kind of soil for construction? It can depend, in part, on what the project is going to be. But speaking generally, soils with a high clay content are going to be tricky. That’s because the clay content will absorb a lot of water and expand, then contract as the water evaporates again. That creates a lot of shifting underneath the structure that can lead to cracks and issues in the foundation. Sandy soils can be difficult, too, as the small particles can shift easily out of place and are difficult to compact and consolidate. However, there isn’t really an issue with soil that can’t be overcome with the correctly engineered solutions. Even in soils with high clay contents, deep foundations or manipulating the water table can help keep the ground and the foundation stable. For sandy soils, compaction is often key in increasing the stability while deep foundation can also be beneficial. What about various soil types at one site? It’s not totally uncommon for job sites to have soil that varies from one part of the site to another, particularly in large-scale projects that cover a large swath of ground. In these cases, a geotechnical designer will take into account the soil types present across the entirety of the project and design a solution for each area. This is one of the reasons it’s so beneficial to work with an experienced geotechnical engineer; what works in one part of the project might not work in another. No matter what kind of soil you have at your construction site, water is going to affect it and play an important role in stability. In clay soils, more moisture in the ground, either from groundwater, rainwater, or other sources, can cause the soil to swell and put pressure on the foundations. In sandy soils, water can quickly shift the ground around and reduce the stability underneath the foundation. A geotechnical design will take moisture into consideration in all conditions and account for the impact it has on the area. Solutions can be put in place to help control the amount of moisture reaching the soil, including adequate drainage, retaining walls, or working with the water table. Stelcor Piles: These piles can be quickly installed without removing soil, cutting on costs and time. They are great at providing support to large-scale projects in poor soil conditions due in part to the fact that they help condense the soil around the columns and increase the stability of the ground. Helical Piles: These piles are another great stability option and are ideal to use in space that offers confined access, as they can be installed using hand-held tools. These piles look a bit like giant wood screws and behave in much the same way. They are screwed into the ground quickly and don’t require excavation of the soil beforehand. They are very fast to install and can help move a project forward quickly. Underpinning: This is a solution that can be used when foundations on unstable soils are starting to slip and move out of place. Underpinning helps to lift them back into place and hold them there, giving the building the stability it needs and isn’t getting from the ground. Geo-Joist Floor Slabs: This is a system that we’ve used extensively on projects (you can check out a project analysis and see how we’ve been putting them to work). These slabs can span across areas of unstable soil and provide the soil base that’s required. It reduces labor costs because it creates a vapor barrier, insulation, and concrete joists in one step. It can also speed up the time frame of the project. In addition to these solutions, CMI offers foundation packages that can reduce the amount of excavation that needs to be done, which is often one of the most time consuming and expensive parts of a construction project. These can be excellent for areas where there is a lot of fill dirt to contend with, which often has poor compaction and presents stability issues for the builder that can quickly become expensive without the correctly designed solutions in place. Is your construction project facing increasing costs and delays because of unstable soil? It’s time to call in the CMI Structural Solutions team. Our geotechnical designers can help evaluate your current plans as well as your soil conditions, then recommend and design solutions that will help you get your project moving forward again. The weaker your soil, the more protection your project is going to need, and CMI can help ensure you have the best foundation possible to start building on. 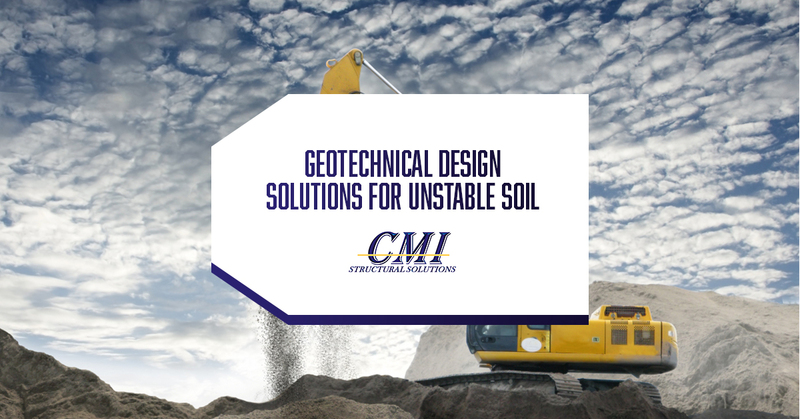 Get in touch with our team today to learn more about our unstable soil solutions. You can reach us by giving us a call or contacting us through our website. We’ll get back to you with the geotechnical design solutions that we can provide to your next construction project.